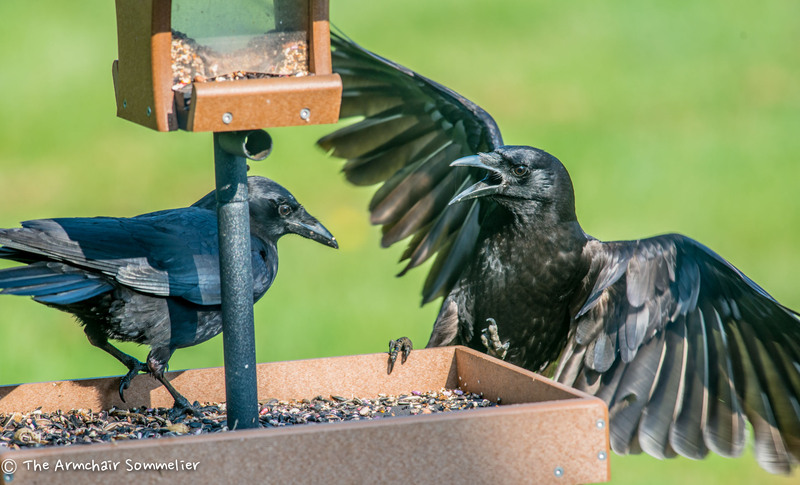 A murder of crows visits my backyard bird feeder. They’re bullies, but they’re fun to watch! Our theme for the Weekly Photo Challenge this week is: Muse. Our instructions: What subject keeps you coming back? This week, show us your muse. If you’ve followed my blog or Instagram/Twitter/Facebook feeds for longer than about a week, you know birds are one of my favorite muses. I love to take pictures of birds. I’m not sure why, exactly. My grandfather loved birds. My father loves birds. Maybe it’s in the genes? Whatever the reason, birds amuse me. They all have different personalities, and once in a while, I get lucky and capture a moment. I have a murder of crows (I love that a group of crows is called a murder) that visit my bird feeder quite often. Honestly, crows are bully birds — when the crows swoop in, all the other birds head for the hills. And then the crows have the feeder (and the feed!) to themselves. And crows are always hungry. And greedy. But, crows are also some of the smartest birds. And they’re very difficult to photograph. If they detect even the slightest motion, they will take off. You have to be a stealth photographer to capture them. I can’t decide exactly what’s going on in this photo, but it makes me laugh. If crows could talk, what would he be saying? It does look like they’re bickering, doesn’t it? Cheers, Frank!! How many times do I have to tell you to keep your feet off of the food? Feet off the food! I love it . . . Cheers!! Their close relative, Magpies, dominate the local feeders more than the crows in our neighborhood. The iridescent blues that shimmer in the light are so beautiful, but they are the only birds our cats hide from as they can be quite aggressive. Excellent shot, you must be a stealth photographer! I haven’t seen any magpies at my feeder. Maybe my murder of crows keeps them away?? I have, however, caught my neighbor’s black cat at the top of my feeder!! That was a sight, let me tell you! Thanks for the lovely compliment, Gale! Salud! !